MOJO's all new Double Trouble Calling System is a new, innovative, programmable, all digital, electronic game caller with useful "industry first" features combined with a built in decoy. It comes equipped with 50 versatile game calls that can be used for anything from predator hunting to bird deterent. Use the Free Call Management Software to easily add and manage your sounds. Designed by Mr. Predator himself, as a Byron South Signature Series Product, the Double Trouble combines a state-of-the-art remote controlled caller capable of high quality sounds with MOJO's wildly popular Critter decoy plus built-in retractable tripod legs. 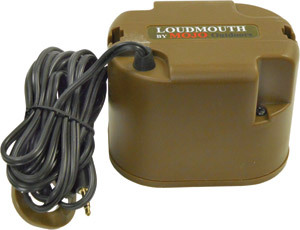 Specially designed external speaker for times when you need more volume that the internal speaker will provide, the Loudmouth is a lot of sound in a small package. Designed for the Double Trouble Calling System and other audio devices that use a 3.5mm audio port. It is a horn speaker, 15 watts, distortion ratio 1.4hz and at 4-¼ x 3-7/8 x 3-1/8 inches is very portable and comes with a specially designed attachment strap that allows it to be attached to the side of the Double Trouble to get the speaker up off the ground to improve sound quality and distance. Same brown color to match Double Trouble, comes with 8 feet of cable.